We are just getting into winter - or whatever little of it that we have in this part of California - but the makeup counters are already filling up with spring makeup collections. 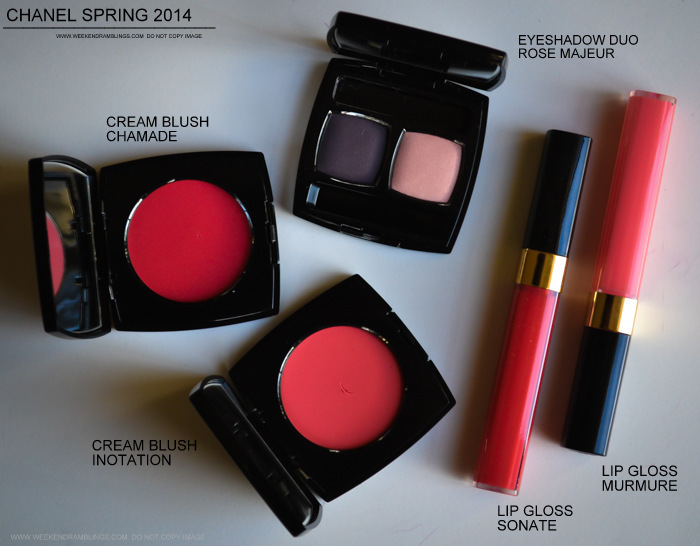 Chanel's Spring 2014 Makeup Collection - Notes de Printemps - turned up online and in stores last week. 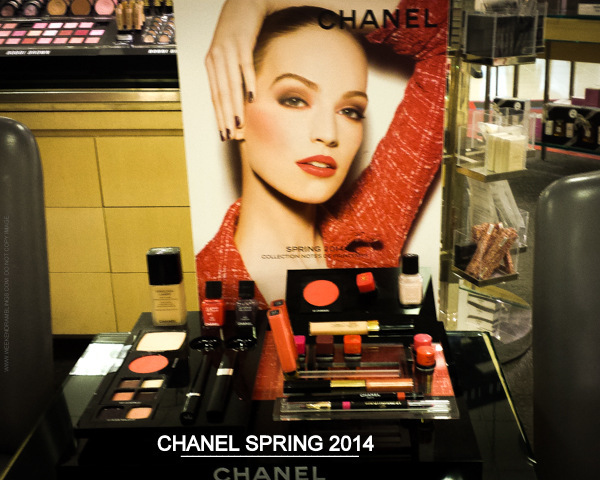 I got a few of the products from the Chanel website (free overnight shipping, so no waiting), and I got to swatch most of the collection at my Chanel counter at Nordstrom too - blurry photo added in below :P Anyway, the collection seems perfect for spring and any other sunny day with a lot of peaches and corals. I will post reviews on the products I picked up in a bit, but for now, here's a look at some swatches. 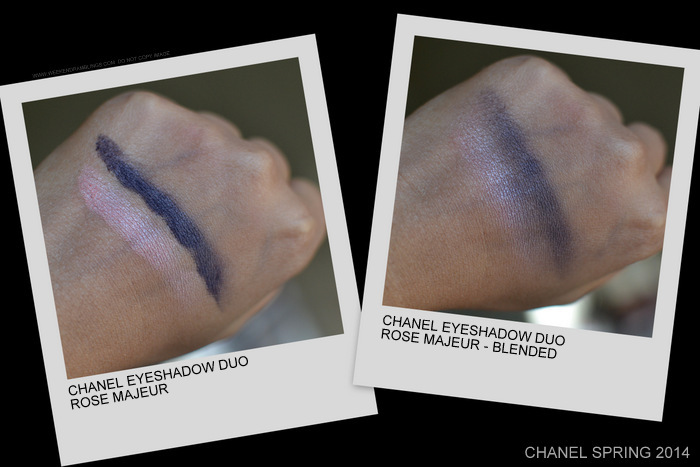 Chanel Eyeshadow Duo in Rose Majeur - dark matte eggplant-greyish shade and a satin-shimmery peachy pink. It leans a bit cool, and while I prefer warmer shades, I love the Chanel eyeshadow duo formula, so this was an easy pick for me. Chanel Eyeshadow Quad - Quadrille: The quad leans more warm, compared to the duo, and has a dark brown matte, a fabulous peach, ivory, and a satin lavender grey. I loved the peach and brown combination - which is what I suspect the model has in the Chanel campaign photo - but apart from the peach, the colors aren't all that very unique so I had to skip. Honestly, it should also be no more lipglosses either for me, but I just couldn't resist picking up two of the new Levres Scintillantes Glossimer - Sonate and Murmure. 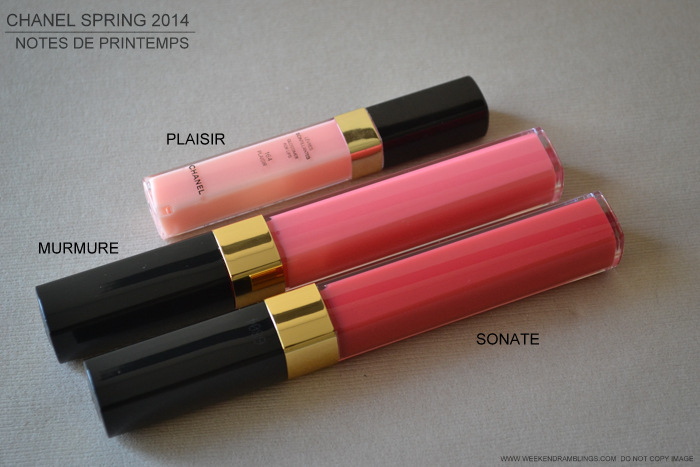 Both are nonshimmery and quite pigmented (by gloss standards), and of course, feel fabulous on the lips. Plaisir I added in because I read somewhere it's a part of this collection, though I don't think it is. Anyway, it's an older lipgloss and a milky peach color that doesn't really show up at all on my lips, but I have a sample so a mini-yay. 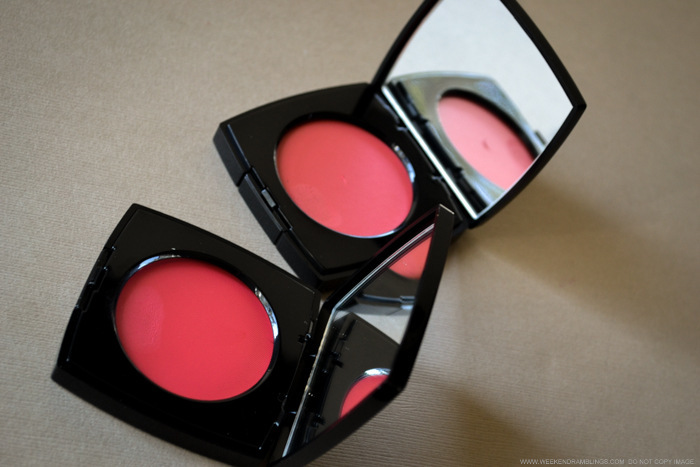 Chanel Cream Blush - Intonation (warm peach pink) and Chamade (deeper rose pink). Both are the sort of colors that I could wear any time of the year, but of course, perfect for spring. If like me, you weren't too enamored with the Chanel blush formula you might want to try the Tom Ford Cream (not liquid) Foundation brush to apply these. It's small enough to give a controlled, buildable application and blends the blush beautifully with hardly any effort beyond stippling the color. The blended swatches are more true to the color than the he heavier stripes. 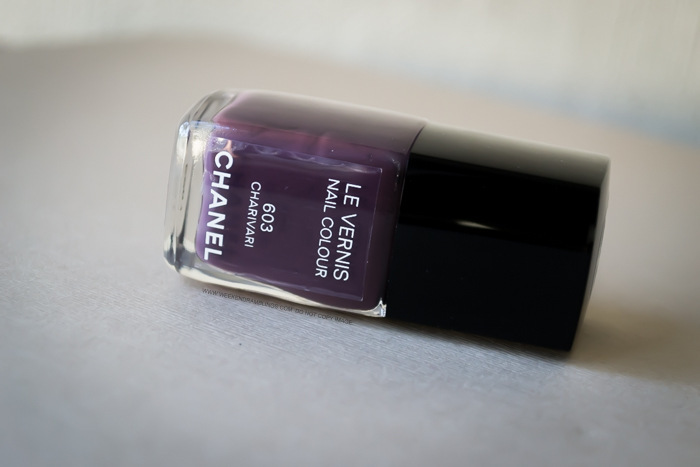 I also picked up Le Vernis - Charivari. It's a deep creamy eggplant, and while not really a very striking spring color, it's the sort of deep smokey color that I love. I haven't yet tried this on my nails, but here's a quick photo/swatch. I have added in Chanel Paradoxal and Vertigo for comparison. Best Things in Beauty has quite a few reviews: Chanel Glossimer Sonate - Chanel Cream Blush Intonation and Chamade - Chanel Lumiere Facettes Quadra Eyeshadow in Quadrille. 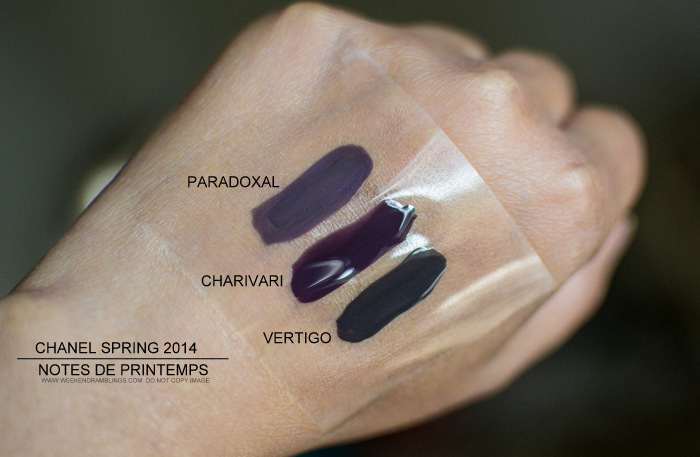 And of course, the amazing Specktra Chanel Spring 2014 thread which has fabulous swatches and helpful comments on the collection.